Buckle up, my sisters. Every once-in-a-while I think situations call for a bit of tough love and today is one of them. After speaking to a few women yesterday who have reached the point of desperation, I needed to share this message with you in this particular way. My point is not to make you feel guilty or condemned, but instead to give you a clear picture of what it will take to achieve your goals. For those of you who are truly ready, I pray you will put these principles into action right away. In the 1992 movie, A Few Good Men, Jack Nicholson delivers a powerful line to Tom Cruise, “You can’t handle the truth!”. Isn’t that how we are with the truth sometimes? We would rather suffer in our misery than face the truth. If we’re honest with ourselves, most of us are not willing to do what it takes to achieve our goal weight. Without willingness, our entire weight loss journey is all in vain because everything we do will be just empty promises to ourselves and God. A willing spirit is what empowers us to put our faith into action and trust God, instead of always being led by our flesh. Unless you’re willing, you will continually be fighting yourself throughout the entire journey. Willingness is the key that will determine whether your journey will be an uphill battle, or a steady progress dance perfectly filled with forwards and a few backward steps. Unfortunately, much of our weight loss journey can feel like a battle of wills between us and God. Yes, we truly want His best for our lives, but deep down inside we want to eat what we want and when we want, and we want to do what we want to do when we want to do it, so we don’t go to Him for fear that He will deny us our pleasures. No matter how much you may want to lose weight, if you’re not willing, change will never happen. Ask yourself, what is your “Yeah, but …”, then turn it over to our God who has equipped you with the ability to overcome your biggest roadblocks, but only if you’re truly willing. Like the story of the rich young ruler, when many of us find out what it REALLY takes to achieve our goal, we’re not willing to give up the security of what we have (even though it may be killing us) for what we really want. So we walk away with our head down realizing that we may want it, but the sacrifice is too much (Matthew 19:16-22). Although this story is referring to money, ask yourself if this story can also apply to your health journey. To many of us make this about us. I know what you’re thinking. Of course, it’s about me. I ‘need to’ learn to eat better; I ‘need to’ get my emotions under control; I ‘need to’ get to the gym. Here’s the thing. You probably have already realized that you can’t make yourself do anything you don’t want to. Our Christian life and everything it entails, including your health, is about pleasing God and living for him. It’s not about blowing our diet or not reaching our 10,000 steps. It’s not about the number on the scale. It’s about our commitment and obedience to God. Like David, you must understand that no matter how big or how small you mess up, what’s most important is your commitment to God. Don’t make losing weight about you—make it about pleasing God and your spirit will become more willing. Gastric Sleeve Surgery! Garcinia Cambogia Extract! Hydroxycut! Liposuction! I’ve worked with clients who have tried them all, and in the majority of cases, they’re still very dissatisfied with themselves and their bodies. I’ve also worked with clients who are 95 pounds and when they look in the mirror, they still think they’re fat. Why? 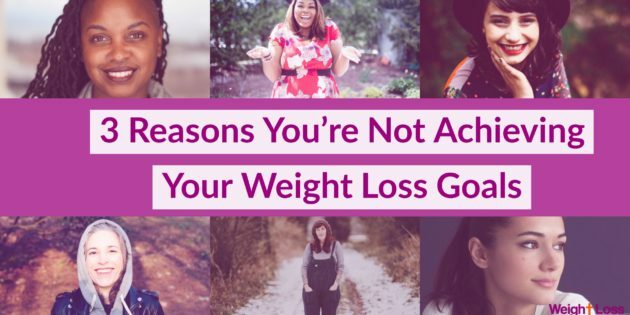 Because they still have not dealt with the emotional and spiritual issues around weight loss. Trying to lose weight by having your stomach stapled is like trying to put a band-aid on an on open oozing sore (sorry for the vivid detail). Until you deal with the infection, the band-aid won’t have much effect. Stop running from the truth. God will only cover what you’re willing to uncover. Continually searching for the right solution only ties God’s hands, because you’re choosing to control the situation by keeping the truth from yourself and from God. Although God already knows, He needs you to see the truth for yourself in order for transformation to take place. As painful as it sounds, you’re choosing your way over God’s. If you keep spinning your wheels year after year, it’s time to face the truth–YOUR WAY IS NOT WORKING and probably will never work if you keep trying the same old ineffective methods. It’s time to try another way, my sister! Can you see yourself in any of these three scenarios? If you were nodding your head in agreement as you read this post, share your feedback in the comment section below. How is the Holy Spirit talking to you? What step will you take to get real with yourself about this journey? These principles are taken from our Weight Loss, God’s Way Program. If you’re ready to move from wishing and wanting, to actually taking action, consider partnering with God and us as we show you how to let your faith be your guide. Thank you for keeping it real. Everything you wrote is true. I’m ready to focus on God.